Flamingos are filter feeders which means they take in water and food, and then the water is expelled from the body. You will notice that they feature a beak with a unique design. It allows them to easily consume the foods found in their diet. This includes crustaceans, mollusks, seeds, insects, various types of algae found in water, and even diatoms. Different species of Flamingos feature different styles of beaks too so that influences what that particular species is going to eat. 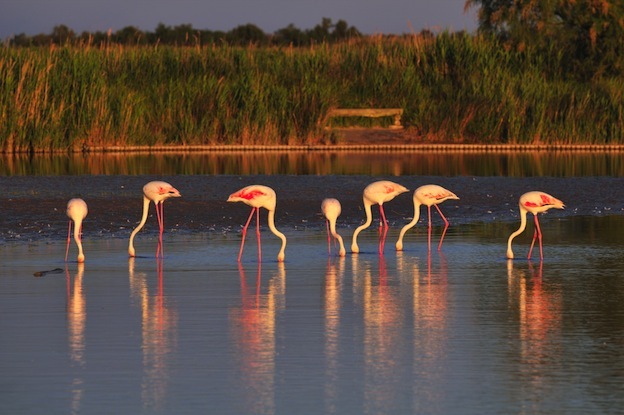 This is why you will find various Flamingo species in different habitats. The food supply there has to be something that they will easily be able to consume. To get the food available to them, you will see the Flamingos stopping their feet in the mud. This helps to stir up the food sources and bring them to the surface of the water. What is interesting is how they lower their head upside down into the water to consume food. They move their head back and forth from side to side. This process allows them to collect the mixture of water and food. Flamingos breathe in air, so they have to hold their breath while they are under the water looking for food. They are able to do so for several minutes at a time before they come back up for a quick breath and then start the process over and over. The process occurs fast though so you many not even realize that they have taken a breath. They have a tongue that is really interesting how it works. Many researchers have compared it a piston on a vehicle. The tongue allows the food and water to be taken in so that the filtering system can do its job. Since Flamingos don’t dive for food, they do need this action to help them. Due to the long length of their legs though, they can move into the deeper waters to find food. Most of the time they will be found on the shores though of the water. When they are in the deeper areas it can indicate that there is a lack of food for the entire colony to adequately survive on. However, they are able to fly for hundreds of miles a day in search of food if they need to without any problems. This is one of the known survival skills of Flamingos that allows them to evolve and to adapt to new environments around them. 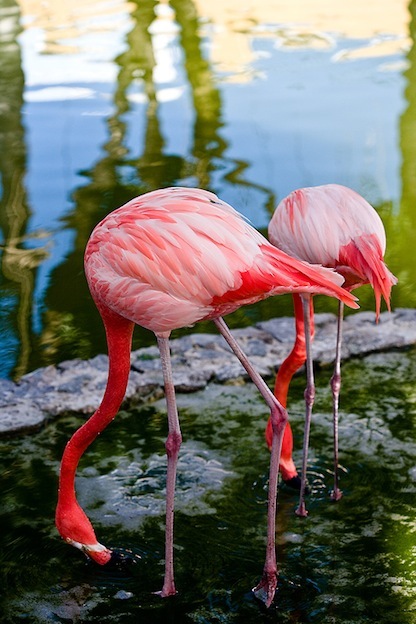 Flamingos don’t get the water their bodies need from their food though like many animals. Instead they also need to consume large quantities of fresh water daily. Many of the areas where they live contain large amounts of salt in the water though. They may need to fly to find fresh water. They have salt glands in their nostrils that allows them to remove the excess for their bodies. The diet for Flamingos in captivity is very different but it still offers them the nutrition that they need to thrive. They are fed pellets that have the pigmentation in them that they would ordinarily get from their diet in the wild. This way they don’t lose the colors on their feathers that come from the Beta Carotene in those foods sources. These pellets are put into a water source though so that they can continue to eat it with their filtering system like they would in the wild. Most of the Flamingos adjust to this type of eating very well.